Over the weekend I made a huge push to rethink & reduce, without regret, our Christmas decorations. On FB I posted a quick calculation and assessment of the situation... When you are nearly fifty years old, have moved twenty-five times in forty-two years, and have saved ornaments since you were ten. I am absolutely, positively, honest to goodness purging! We made our local family charity and resale shop happy, freed up a lot of attic space, and we still have more than enough glitter and greens to go around, and around and around! 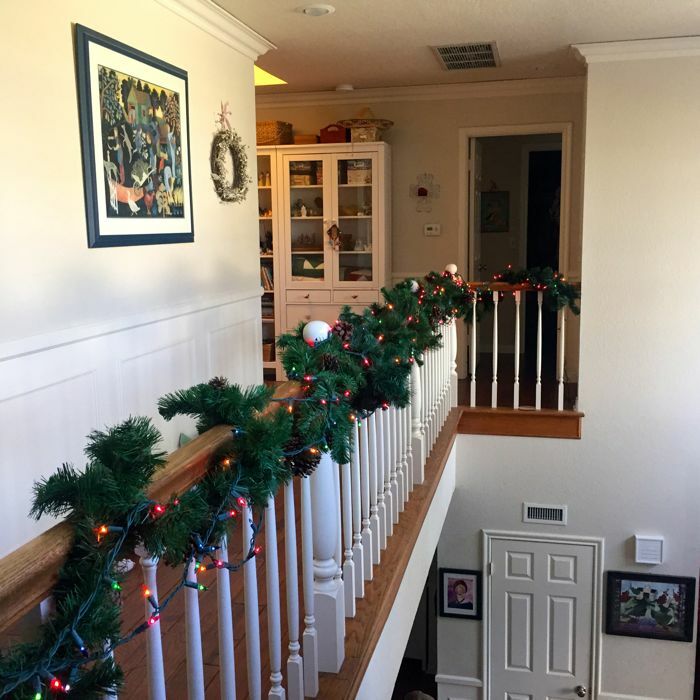 Alex and Max took some festive initiative, and entwined the banister with garlands and lights. It looks so cheerful, especially at night. Just sitting here and thinking... letting go can have such a liberating, calming effect. Things and ideas, both, can sometimes be burdensome. I like being reminded of the ease that comes from traveling a bit lighter. Simplifying seems to be a theme. Roomie and I did the same, divesting ourselves of a carload full of greenery and decorations a few weeks ago. I like that you described the resulting feeling as calming. Yes!